Anyone who has followed Iran's behavior since the 1979 Revolution cannot escape the fact that Iran is bent on restoring some, if not much, of its historical glory as the empire that for centuries dominated the Middle East and beyond. The 2003 Iraq War, which brought the Iraqi Shiites to power, provided Iran with a momentous opportunity to establish a strong foothold in Baghdad. Moreover, Tehran's enduring support of the Assad regime in Syria, its continuing aid to insurgents and terrorist organizations throughout the region, its rejection of Israel's very existence, and its challenge of the Sunni Arab states all point to its regional ambitions and national aspirations. Regardless of the Iran deal, Tehran's quest to become a nuclear power will not change. Iran is determined to maintain its dominant role over the crescent extending from the Mediterranean to the Gulf (including Iraq, Syria, and Lebanon), which is at the core of its long-standing drive to emerge as the region's hegemon. The real or perceived threat against Israel and the Sunni Arab states that Iran poses, however, cannot be dealt with by merely reiterating how ominously dangerous Iran is, as Prime Minister Netanyahu and other Arab leaders have often done. Although the Iran deal is designed to prevent it from acquiring nuclear weapons, Tehran will eventually attain the technology and materials necessary to produce a nuclear weapon in short order. Indeed, in spite of the sanctions that nearly crippled its economy, Iran has remained resolute in pursuing policies consistent with its overall objective. In fact, there is little that either Israel or the international community can do to prevent Iran from realizing the nuclear threshold once the deal expires, or perhaps even before that. Attacking Iran's nuclear facilities now or in the foreseeable future will do no more than temporarily halt Iran's nuclear weapons program for only a few years. Iran will then be in a position to resume it with greater resolve and reject any international monitoring. Moreover, the unpredictable consequences of such attacks could ignite a major regional conflagration that neither Israel nor the Sunni Arab states want. For these reasons, to counter Iran's regional ambition, Israel and the Sunni Arab states should establish a parallel crescent to stop Iran in its tracks (see map). 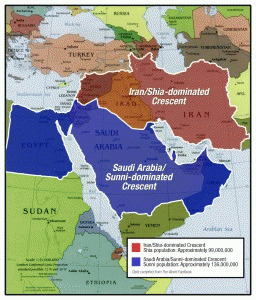 The new crescent would similarly extend from the Gulf to the Mediterranean and include Saudi Arabia, Bahrain, Kuwait, Qatar, United Arab Emirates, Oman, Jordan, Palestine, Israel, and Egypt, with a Sunni population of approximately 136 million, versus Iran, Iraq, Lebanon (where Hezbollah wields significant power), and Syria (where the vast majority of Shiites are Alawite), with approximately 99 million Shiites. All 10 states share deep concerns about Iran's regional ambition and all wish to eliminate, or at a minimum neutralize, Iran's dominance in the years ahead. Creating such a crescent, with strong military and strategic cooperation between all the states, will send a clear message to Iran that it has "no place to go but east," and that crossing this "red line" will be at its own peril. The main problem here, of course, is the missing link. Given that there is no Israeli-Palestinian peace, the Arab states will not agree to establish such a bloc that will include Israel, which is a critical requisite not only for establishing a contiguous land mass, but also due to Israel's military prowess that can undercut Iran's interventionist strategy. 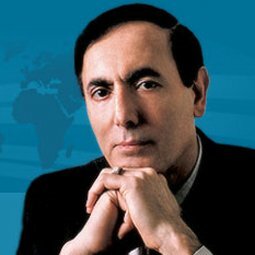 Any Israeli Prime Minister, especially Netanyahu, who relentlessly invokes the existential threat that Iran poses, needs to recognize that the new geostrategic development in the region offers Israel a golden opportunity to effectively neutralize the Iranian threat and at the same time reach a comprehensive Arab-Israeli peace. Such a peace would substantially strengthen Israel's national security and neutralize not only the Iranian threat but that of any other extremist group that Iran sponsors, such as Hezbollah. The danger that Iran poses has already brought Israel and the Sunni Arab states much closer to one another. Currently, there is extensive collaboration and intelligence-sharing between the two sides. The Arab states view Shiite Iran, not Israel, as the greatest threat to their sovereignty. They also know that whereas Israel still occupies the West Bank, it has no desire to dominate any Arab state. The Iranian threat, which will persist for years, if not decades, should be the catalyst for creating a formal new Arab-Israeli alignment with the strong support of the United States. The common denominators that unite them today are far greater than their disagreement over the Israeli occupation, which is an inescapable fact that Israel must bring to an end. The current violent flare-up between Israel and the Palestinians offer a crude wake-up call to every Israeli that occupation is the "mother of all evil." Rather than continuing to drum up the danger of the Iran deal, Netanyahu should focus on addressing the more urgent conflict with the Palestinians, which has the potential of either exploding with disastrous consequences or providing the impetus for a new peace initiative that will end the Israeli-Palestinian conflict.